I recently attended the first inland river General Response Plan (GRP) meeting in the state of Connecticut. 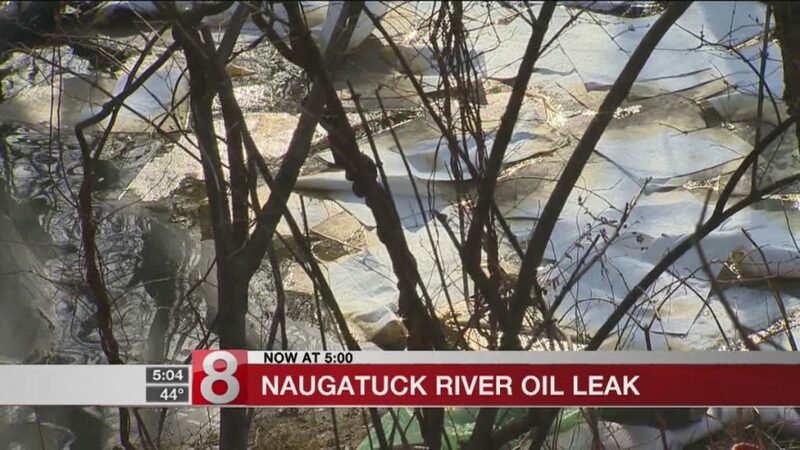 People may remember the January 2018 oil spill in the Naugutuck River from the Somers Thin Strip Plant when several thousand gallons of oil made its way into the Housatonic and from there into Long Island Sound. I spoke with Peter Zack, who is the acting director of CTDEEP’s spill response program, soon after the spill about what plans were in place to address such incidents. At that time there weren’t any. There was a response to this oil spill but it was much too late, raining and in the dark by the time the first boom was set. This inspired Mr. Zack, who started looking around for funding sources to support spill response planning on rivers. He discovered our neighbors in Massachusetts had the EPA fund plans for all their major rivers. If MA could do it why couldn’t CT? Peter applied to the EPA program and soon received funding to kick off the planning effort using the Naugutuck and Housatonic Rivers as the first subjects. There is a long history of industrial spills on these rivers including an area where tanker train cars periodically tip over while transporting fuel inland from the ports. I consider this a very responsive effort on the part of CTDEEP once the decision had been made to tighten up the protections for CT’s rivers. This project is funded by EPA Region 1 and is the first inland river GRP development project undertaken in Connecticut. This project will develop a total of ten (10) GRPs for locations on the Housatonic River from the north side of the Igor I. Sikorsky Memorial Bridge in Stratford, CT to the Connecticut/Massachusetts border and on the Naugatuck River from East Derby, CT to Stillwater Pond in Torrington, CT. The folks who met ranged from the US Coast Guard & local activist Kevin Zak from the Naugutuck River Revival group to a representative from the State Shellfish Program. Not only do fishermen and swimmers need to be protected from these toxic spills so to do the growing seaweed and shell fishing community. The most important participant however was the CTDEEP employee in charge of responding to the actual spills in the area. He was instrumental in identifying where there was access and river morphology suitable for boom deployment as we travelled virtually up both rivers on google earth. It was a productive meeting, a supportive group and I hope the beginning of spill response plans for all the rivers in our state. 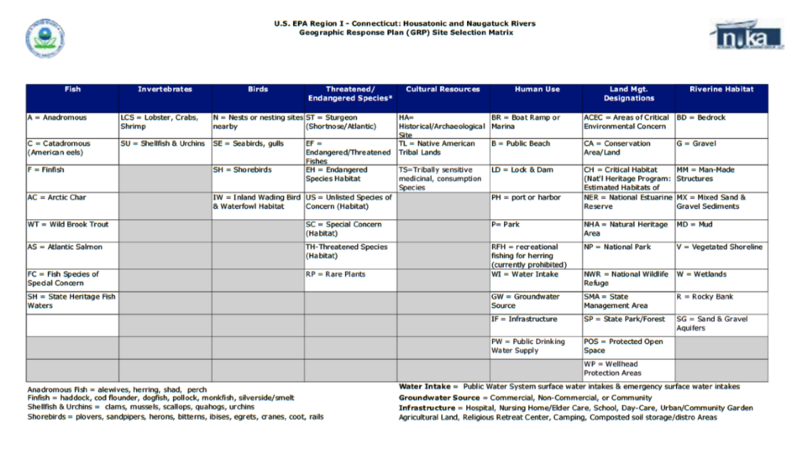 Check out the following table to see what types of concerns and actions are put into the planning matrix used to identify key response sites (fish runs, water intakes, etc.). Planners take into account areas that may need more protection than others. Additional information on these projects can be found at the project site https://www.inlandgrpne.com/ and the GRPs can be viewed and downloaded from the Regional Response Team One (RRT 1) website https://nrt.org/site/doc_list.aspx?site_id=38 . If you have any questions about the project or would like more information, please contact either Mike Popovich, Nuka Research Senior Project Manager, at popovich@nukaresearch.com or by phone at (508) 746-1047 or Mr. James Carew, U.S. EPA Region 1 at carew.james@epa.gov or by phone at (617) 918-1678. If you have a favorite river that is at a risk from toxic waste and oil spills let us know so we can push for additional funding to protect more rivers.